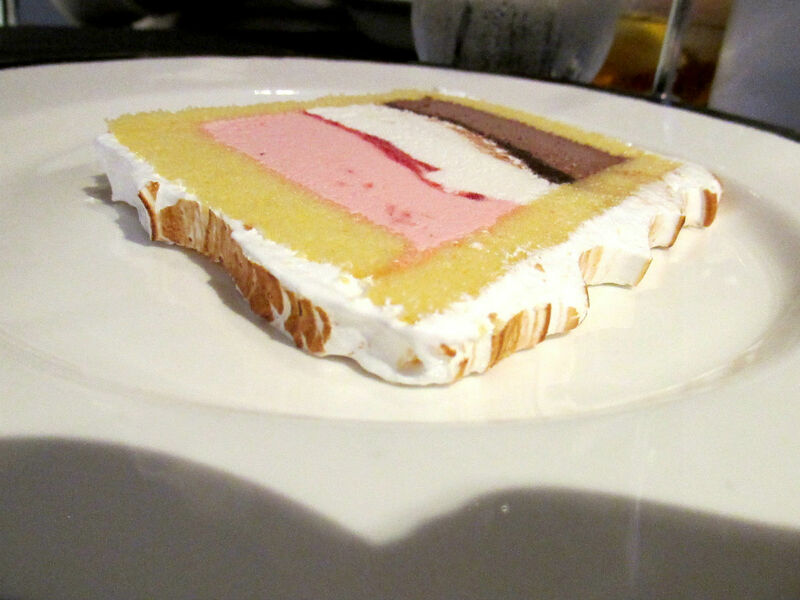 A Work Of Art – It tasted as good as it looks! If you’ve been following along you probably already know by now that I was lucky enough to enjoy a spectacular Disney Alaska Cruise this summer aboard the Disney Wonder. Between rounds of bingo and incredible Port Adventures like dog sledding, riding the rails and soaring in a floatplane, I managed to fit in some time to eat. Talking to several cruisers during my planning, I discovered that dining onboard the cruise ship was a large part of the vacation for most people. Being an extremely picky eater myself, I planned on focusing my meals mainly on dessert. 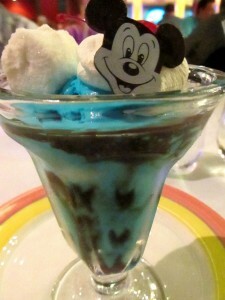 Please continue on to see my dessert lover’s photo diary as I ate my way around the Disney Wonder! As all of us Disney fans know, things are always changing (goodbye, Maelstrom and Sorcerer’s hat!) so it is entirely possible that you might have different desserts available the next time you sail with the Disney Cruise Line. Without further ado, here are the many tasty treats I enjoyed over the seven days! We started our cruise with a lunch buffet at Parrot Cay. They had a nice spread of simple, classic dessert choices. I enjoyed the chocolate chip cookies and brownies, my boys were big fans of the Jell-O and my husband loved the cheesecake. 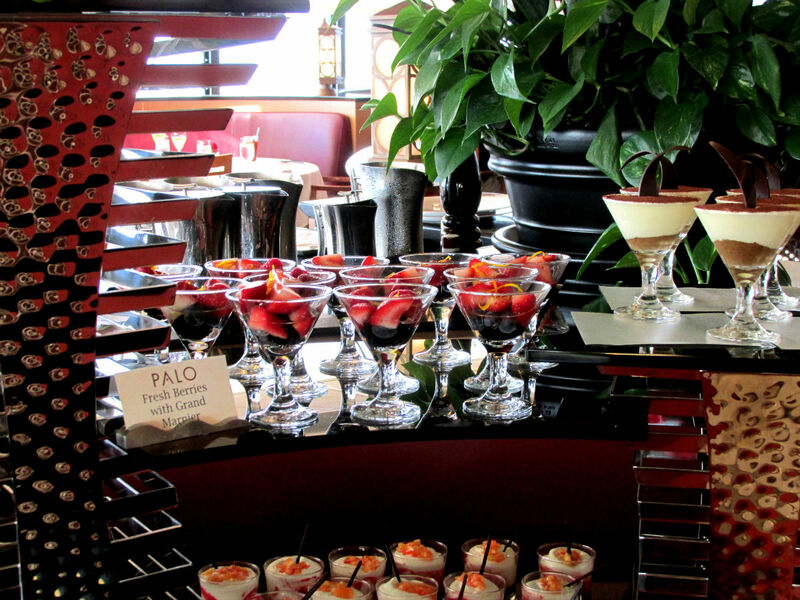 The next morning, my husband and I started off the day with brunch at Palo to celebrate our wedding anniversary. 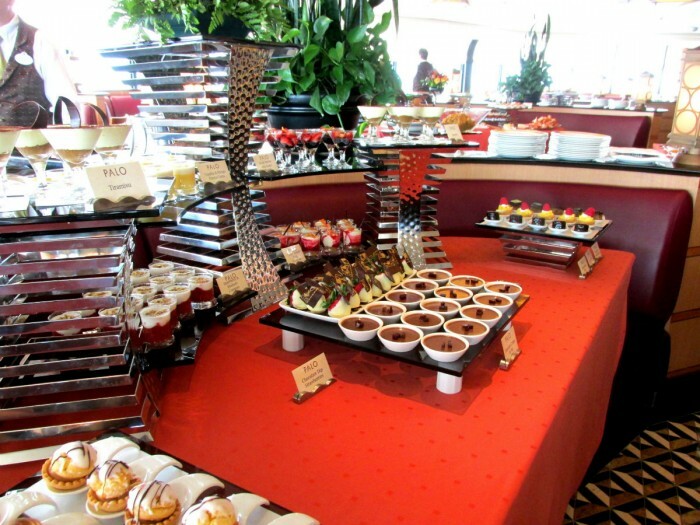 After eating some obligatory breakfast foods, I made a bee-line for the dessert table. 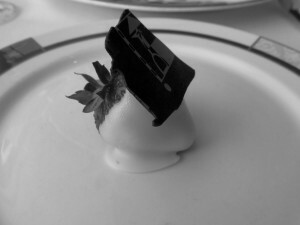 These were by far the best desserts I had on the entire cruise and were well worth the additional $25 charge per person. For you Las Vegas fans out there, I felt like I was in the specialty dessert room at the Wynn buffet. 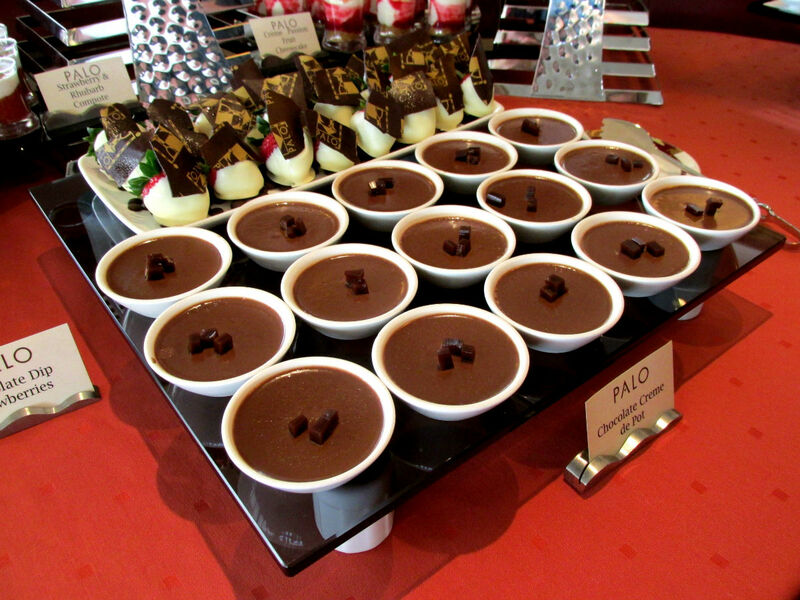 Each dessert was perfectly portioned so you were able to try two or three without feeling like it was too much. 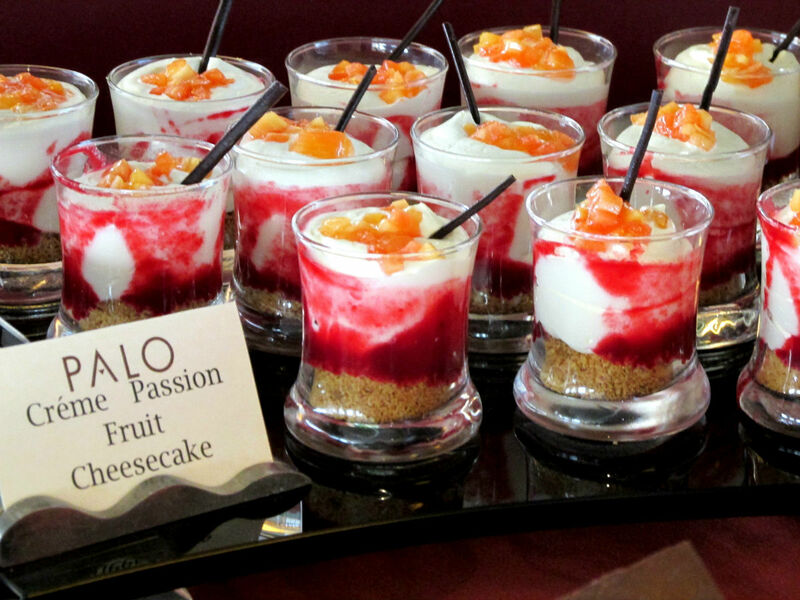 During our nightly rotational dinners at Parrot Cay, Triton’s and Animator’s Palate, we tried a wide variety of wonderful desserts. 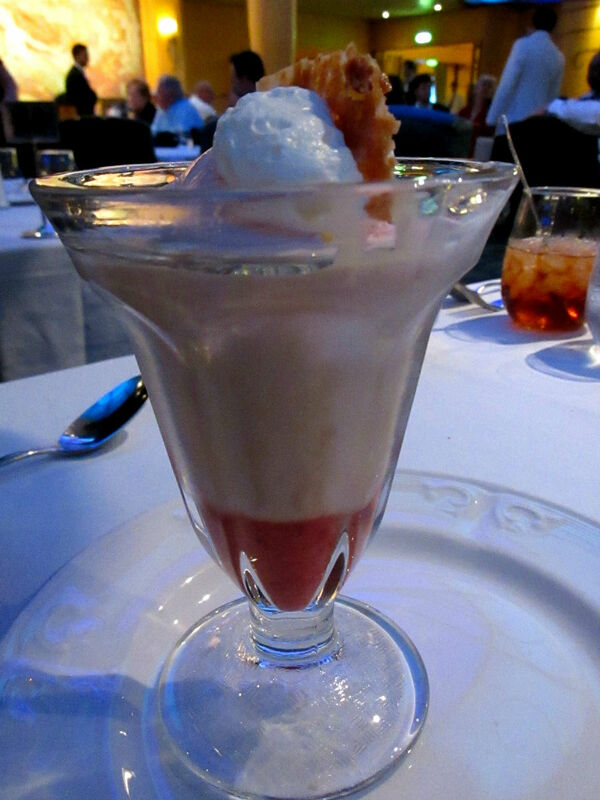 One evening we enjoyed this deliciously sweet strawberry sundae that was made with strawberry ice cream, macadamia crunch and whipped cream. Being a huge chocolate fan, I couldn’t pass up this dessert. 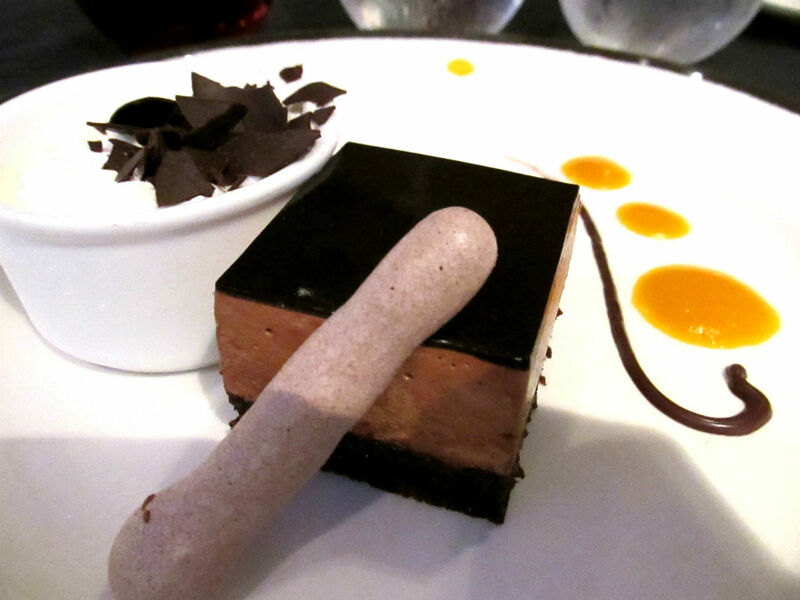 A light and fluffy combination of chocolate mousse, cake and ganache; this one was a favorite! 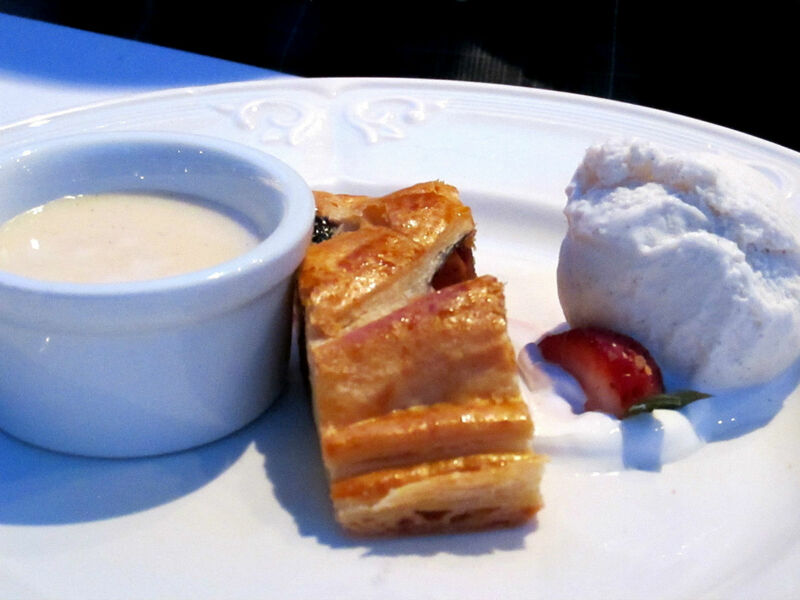 My husband loves fruit pies so we had to try this pear and berry strudel served with ice cream and a vanilla cream sauce. 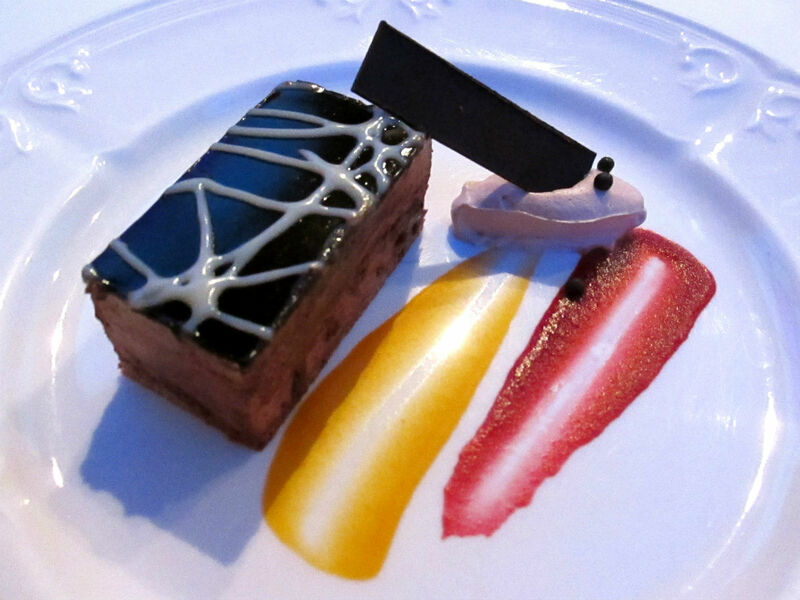 As a special anniversary surprise, we were presented with this luscious chocolate mousse cake topped with dark chocolate ganache. How cute is this? One night my husband tried the “Make Your Own Pie” complete with a mini crust, chocolate filling, vanilla cream and meringue. You just can’t go wrong with a classic cookies and cream chocolate sundae topped with whipped cream and Mickey Mouse sprinkles. This one was a big hit with my boys. 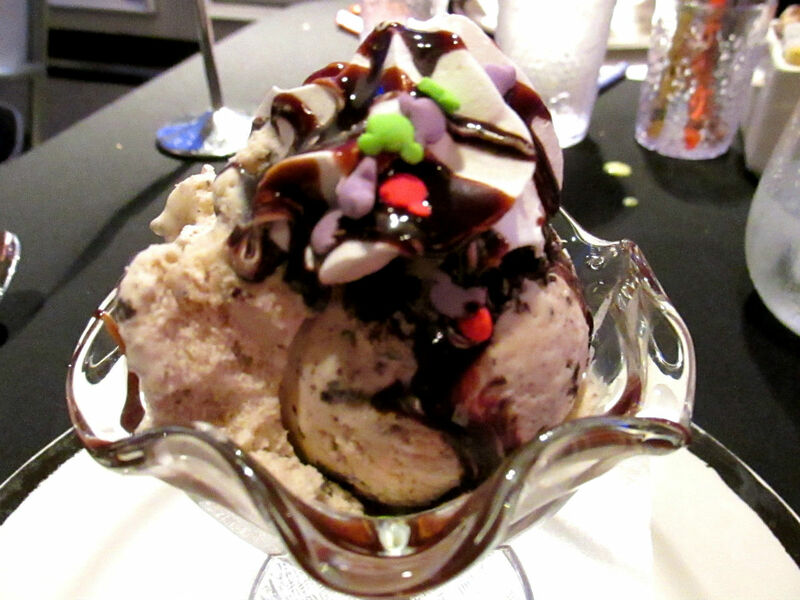 Another tasty ice cream sundae, this time made with bubble gum ice cream. Not the best idea for young children or anyone wearing braces, but I really liked it! 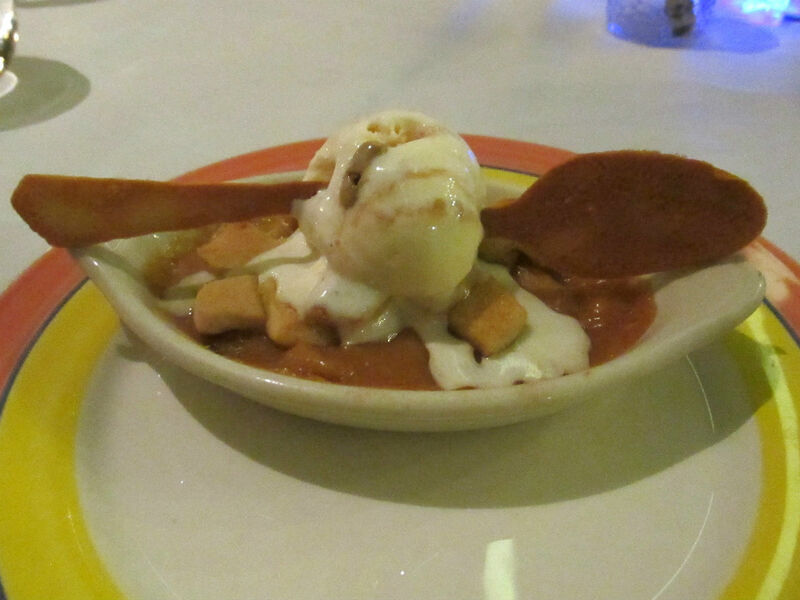 Another fruit pie dessert for my husband, this time made with apple, cinnamon, shortbread and topped with vanilla ice cream, caramel sauce and an edible cookie spoon. Very clever and yummy! 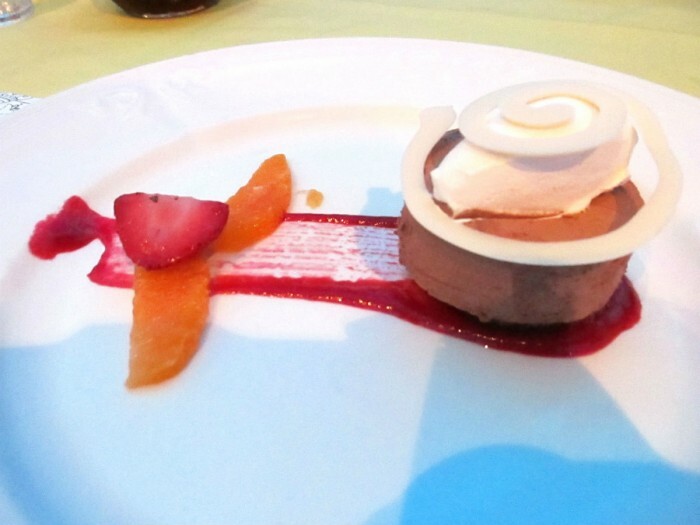 A classic chocolate mousse topped with whipped cream and a white chocolate swirl. This one wasn’t as rich as the mousse cakes and tasted even lighter with the addition of the fruit. More cookies and cream ice cream, this time topped with hot fudge and a cookie! Another fruity dessert, this time my husband went with the pear and apple tart. The caramel and raspberry drizzles really made the dessert! 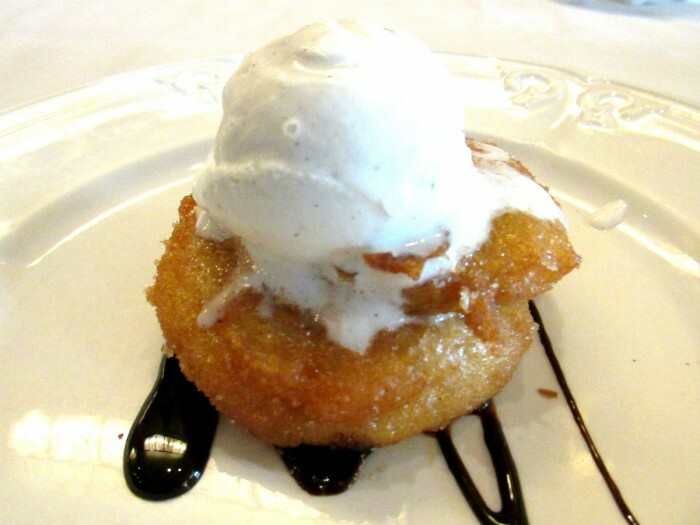 Although I normally I go for the chocolate desserts, this time I tried the apple crostada. I loved the combination of the tart apples, sweet pastry and rich chocolate. The vanilla ice cream helped cut the sweetness a bit. You can’t go to Alaska and not have Baked Alaskan! On the last night of our cruise, my husband chose the Celebration Cake (I was definitely not celebrating the end of our adventure 🙁 !). It was a rich combination of cheesecake, strawberries, vanilla cream and white chocolate. I decided to end our vacation with another take on chocolate cake this time accompanied by whipped cream, mango sauce and chocolate shavings. Anyone hungry now? If you would like to eat desserts on the Disney Wonder and need more information about the Disney Cruise Line, be sure to check out all of the coverage here at TouringPlans or consider purchasing The Unofficial Guide to the Disney Cruise Line. 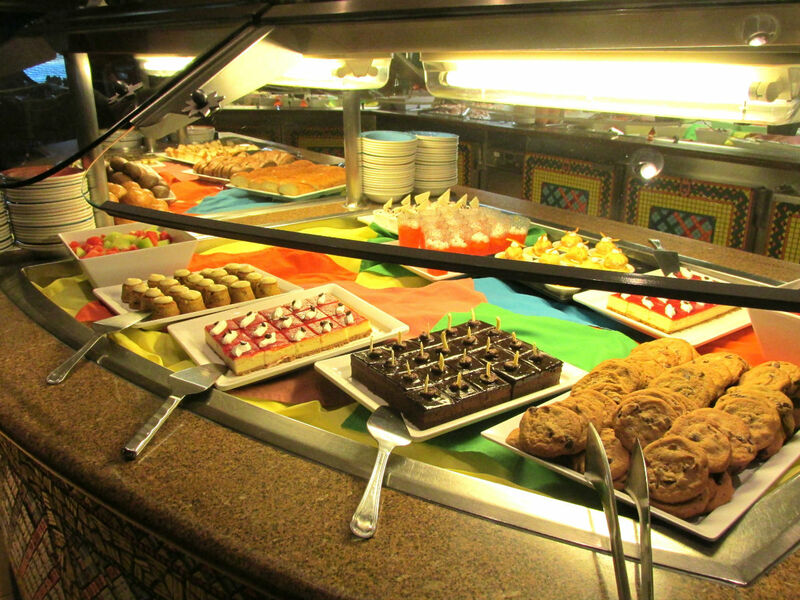 Do you have any favorite desserts that you have tried on a Disney ship? We would love to hear from you! Those desserts look wonderful! Makes me want to book a cruise today! 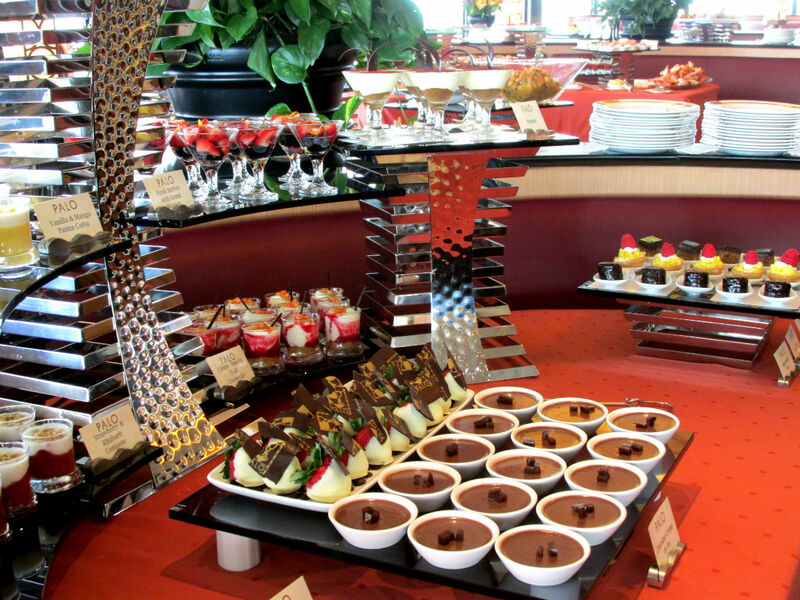 I remember having five deserts once at a Cruise Buffet, while I can’t (and shouldn’t) do that again, these look really good and maybe we should book a Disney Cruise soon. You should definitely book a Disney Cruise. Besides all of the yummy desserts, they are lots of fun! 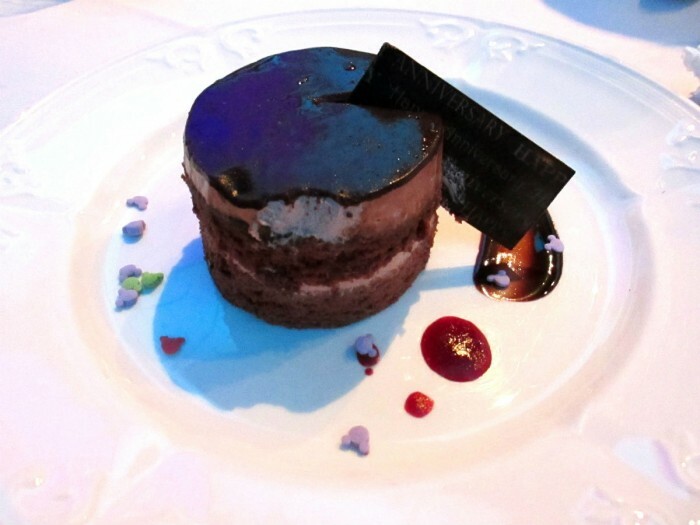 At our dinner at the Magic’s Palo, our server, Susana from Portugal, insisted we have the chocolate soufflé. Featuring both chocolate and vanilla sauces, it was good, but honestly, I liked the Grand Marnier soufflé at Lumiere’s way more. I’m not a fan of candy orange flavor, but this was genuinely orange and the texture was just right for a soufflé. 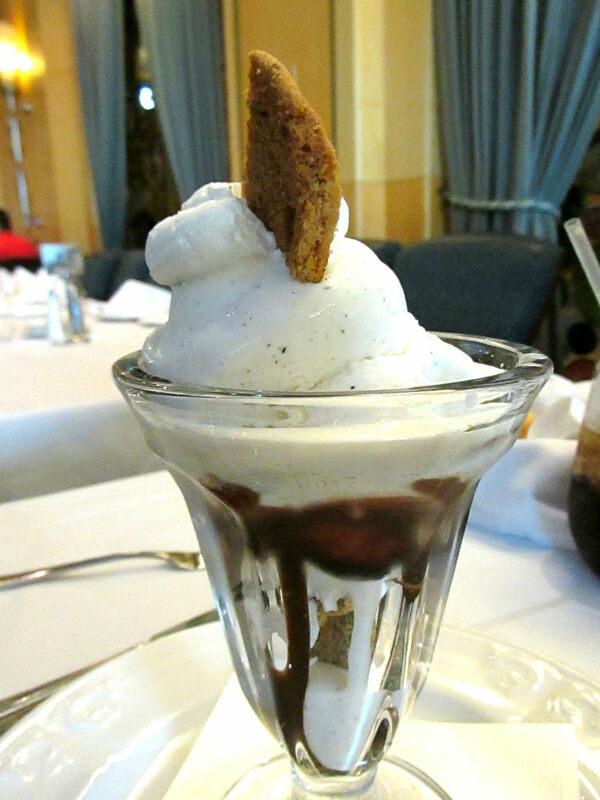 At Palo, my pick would be the zabaglione which is whipped eggs with liquor and this version includes some berries. 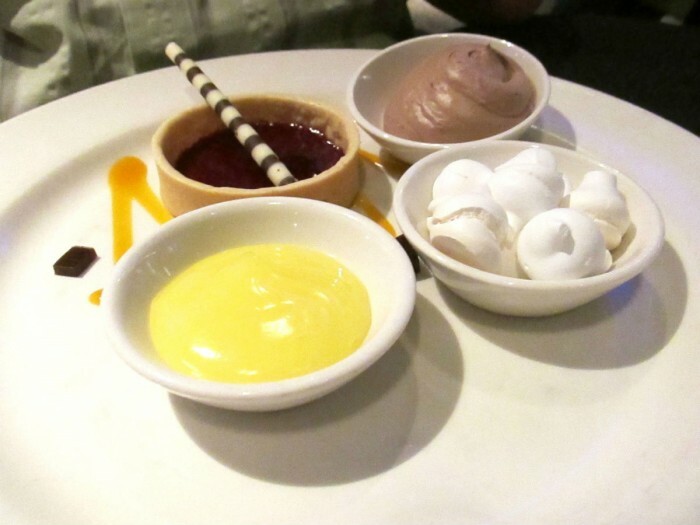 The zabaglione was the top, the soufflé mid, and the other desserts low. Surprising considering how good everything else at Palo was. 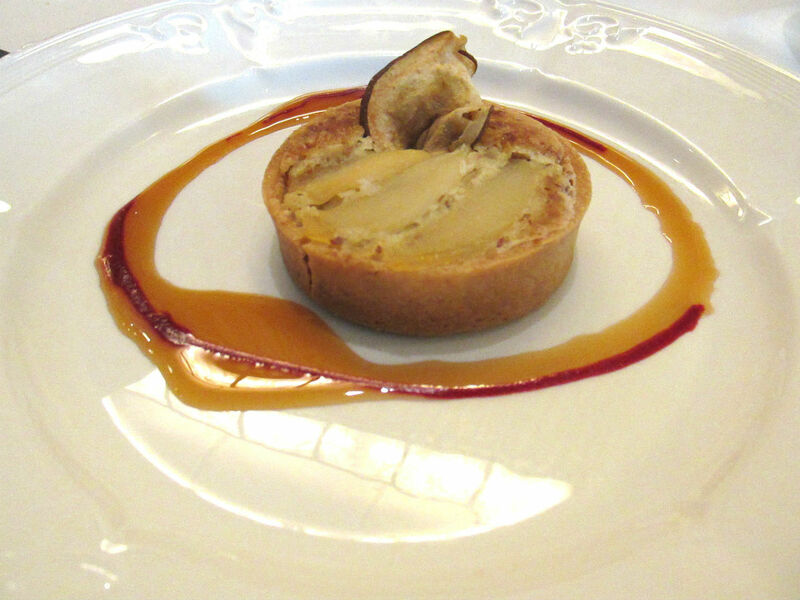 I’d like to try the buffet to see what else they can do in pastry. The other memorable dessert was the mango cheesecake from Cabana’s (could have been mango mousse). I saw a mango cheesecake on the menu at one of the restaurants, and it may be the same thing. 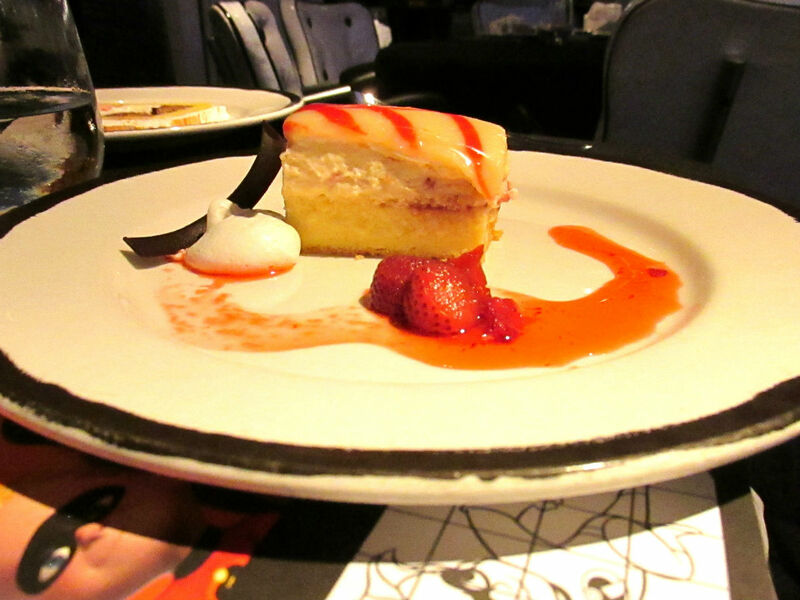 This cheesecake did not have the gelatin texture of another cheesecake I had at Animator’s Palate. I’m hoping they have this when I go on the Dream in December. thanks again, Kristi, for another post about your Alaska cruise. I’m a chocolate fan too, so all look yummy, but I hope we also get a chance to try the make your own pie. I am filing all of these links to refer back to as my 2015 cruise date gets closer. Also, thanks very much for your post on Canada Place – Extremely helpful! I found it after comments had closed so will thank you here for that one, too!